The endocannabinoid system has been considered as a target for pharmacological intervention. Accordingly, inhibition of fatty acid amide hydrolase (FAAH), a degrading enzyme of the endocannabinoids N-arachidonoylethanolamine (anandamide; AEA) and 2-arachidonoylglycerol (2-AG) as well as of the endocannabinoid-like substances N-oleoylethanolamine (OEA) and N-palmitoylethanolamine (PEA), can cause augmented endogenous cannabinoid tone. Using liquid chromatography coupled with positive electrospray ionisation mass spectrometry, we herein describe a method to simultaneously quantify levels of AEA, OEA, PEA and 2-AG in cultured cells. The procedure was developed according to the FDA guidelines for bioanalytical methods validation. 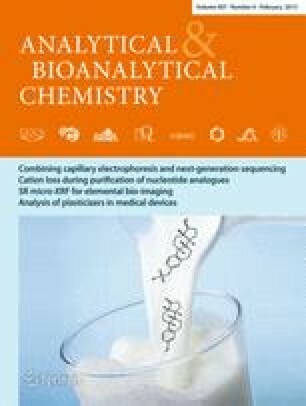 The limits of quantification (LOQs) were 0.05 pmol for AEA, 0.09 pmol for OEA, 0.10 pmol for PEA and 0.80 pmol for 2-AG when molecular ion monitoring was used. In H460 human lung carcinoma cells, basal levels of all four analytes ranged between 2 and 17 pmol mg−1 protein with PEA showing the lowest and OEA the highest concentrations. Endocannabinoid levels observed in mesenchymal stem cells were of the same order of magnitude when compared to those in H460 human lung carcinoma cells. The online version of this article (doi: 10.1007/s00216-014-8384-5) contains supplementary material, which is available to authorized users. The authors wish to thank Ms Y. Wollank for preparing mesenchymal stem cells and Ms A.M. Berg for critical reading of the manuscript.